Zen Studios, the studio best known for its virtual pinball contributions to the gaming world, are trying out some new ways of reminding us of the 80’s glory days. This time, the nostalgia comes in the form of a new dungeon crawling game inspired by the PC games you played when it was too late to organize a Dungeons & Dragons session. It’s called Operencia, and while it draws heavily on the past, it’s the dawn of a new day for Zen Studios. Operencia: The Stolen Sun takes place in the fantastic world of Operencia, a land filled with magic, danger, dragons, and very rude skeletons. When the sun is snatched out of the sky by an unknown evil, the lands are draped in unending darkness, and only you, a simple farmer’s son, can face it. Along the way you meet a host of diverse characters who join you in the quest and become close allies and friends along the way. 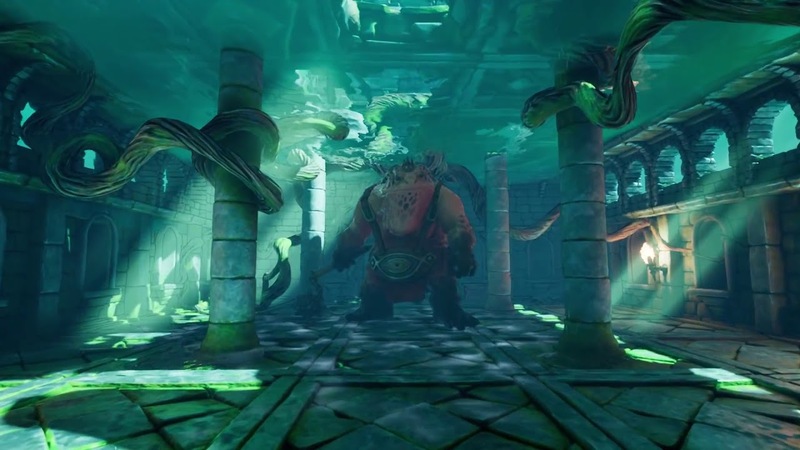 Your journey takes you to a wide variety of breathtaking places from underwater castle filled with demonic toads to the very gates of the underworld. The story and characters in Operencia are both great. Operencia draws heavily from Central European folklore, which gives the world and its occupants an unfamiliar quality to them. The story and places you visit are wonderfully odd and uniquely imaginative, even if the absurdity of it all occasionally makes you laugh, as it did me. And while the characters and dialogue are usually pretty high quality and filled with humor, the voice acting isn’t always so commendable. In the intro, for example, heroes of old fight an ancient dragon while sounding equal parts bored and confused. Still, if you can get past the sometimes lackluster presentation, Operencia has an engaging narrative with some truly memorable party members. Operencia is a tile-based dungeon crawler with turn-based combat, which makes the whole thing decidedly old school — mostly in a good way. If you enjoyed the hallway-delving dungeon crawlers of the 80’s PC era, then you’ll feel right at home with this modernized take on the genre. As with the old school games in this category, your movement is tied to a grid, which you navigate by going forwards and backwards, left and right. As you explore you’ll solve puzzles, collect loot, encounter enemies, and open lots and lots of locked doors. While many of the puzzles are entertaining, some of them are more tedious or irritating than they are clever, and there are enough instances of this for it to become annoying. You might spend an extra ten minutes walking around dark hallways looking for a hidden lever to pull just to find a key that you need to solve a puzzle, which gets old really fast. Luckily, most of the time the obstacles before you can be easily solved if you possess an ounce of cleverness, rather than sending you on fetch quests. When it works, crawling through the dungeons of Operencia can be a lot of fun, but it doesn’t always work. And maybe you’ll call me a heretic, but while the grid-based movement is a good throwback to the dungeon crawlers I played as a kid, grid-based movement is a bit annoying! There’s nothing worse than passing by an item because it doesn’t line up perfectly with one of the squares on the grid, or just not being able to move diagonally to save a bit of time. While the idea is great, I wonder if the game might have benefitted by dropping this particular reference to the games that inspired it. Another thing that Operencia borrows from its predecessors is turn-based combat, and on this note I have far fewer grievances. Combat in Operencia is fast-paced, easy to learn, hard to master, and most importantly: very entertaining. 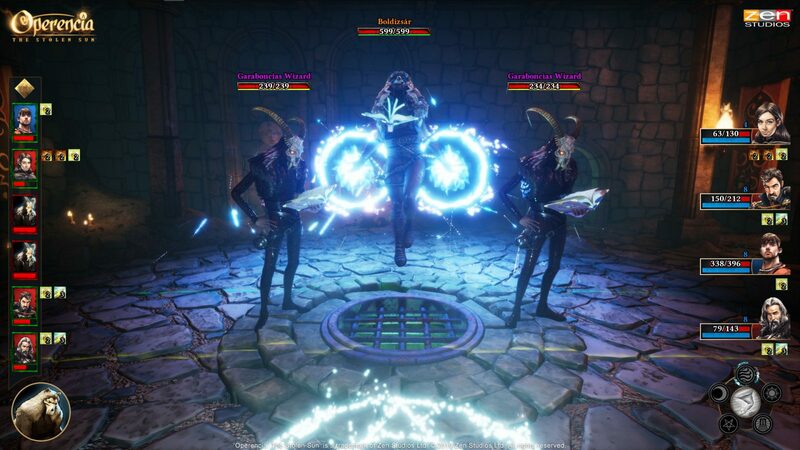 With you and up to 3 allies at your side, you’ll unleash a slew of powerful abilities and deadly spells, which deal damage and apply a wide variety of status effects. Each ability works a little differently: One might be great at attacking enemies who are at long range, while another might be better against those engaged in melee combat. Some might do damage over time to a single target, while another might do heavy damage to every enemy in the battle. By managing your energy points and juggling cooldowns, it’s up to you to figure out the most effective strategies to take your opponents down. There are dozens of different abilities to unlock and improve as you and your party level up, which gives you plenty of room to grow and forces you to make vital decisions that could mean the difference between victory and defeat. 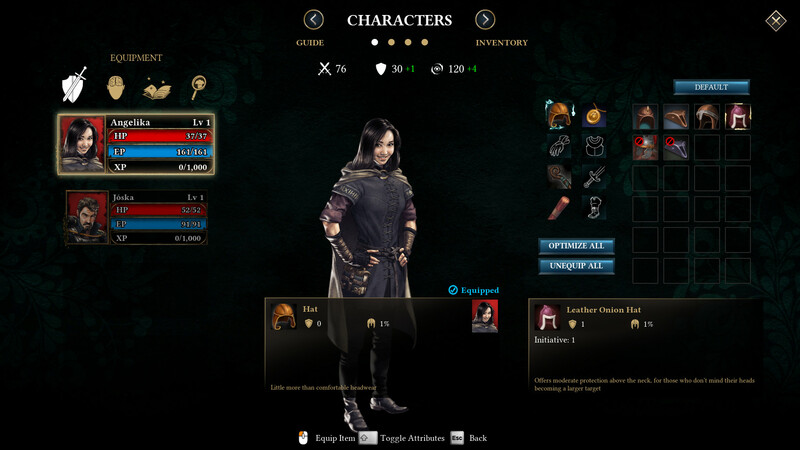 In addition, you’ll be responsible for keeping your characters properly equipped for the adventure by obtaining better equipment and equipping it to the person who can make the best use of it. For nerds like me, this kind of stuff is at the heart of what makes a clunky turn-based game like Operencia such a rewarding, addictive experience. Operencia’s presentation is a bit of a mixed bag. 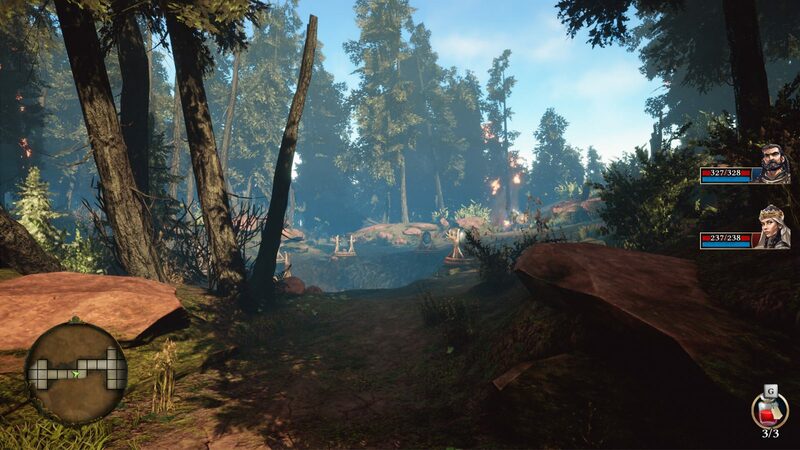 While the graphics are great and the distinct places you visit are truly gorgeous and detailed, the sound design doesn’t always live up to that same standard. In particular, the sound effects are repetitive and sometimes irritating, which may tempt you to play with the sound turned off after extended play. Which is a shame if you do, because the music on the other hand is beautiful and extremely memorable. Operencia is a great dungeon crawling experience that you shouldn’t sleep on, especially if you’re a fan of the genre. While some of the mechanics and presentation are a little hit-or-miss, that shouldn’t scare you away from the unique world, memorable characters, and excellent combat that Operencia has to offer.